Our transition from Italy to Switzerland took considerably longer than expected. 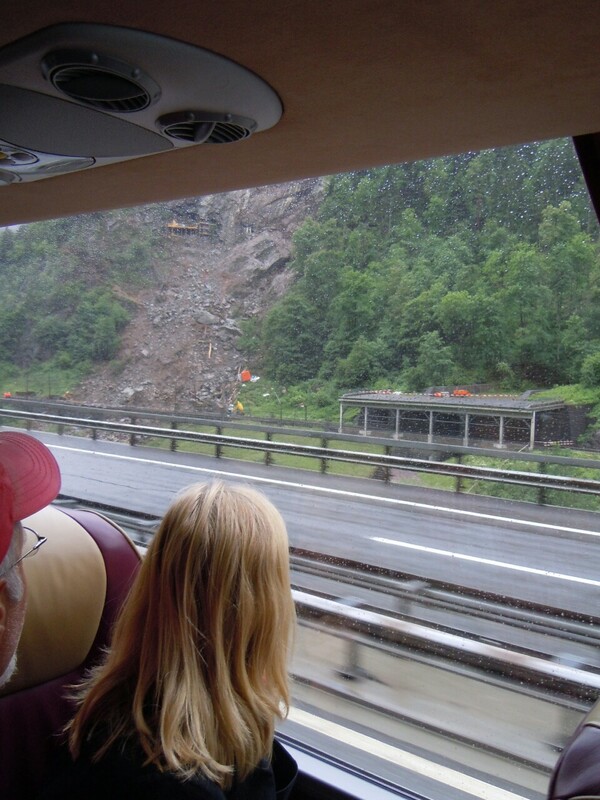 Due to a rock slide in Switzerland part of the track was inaccessible. 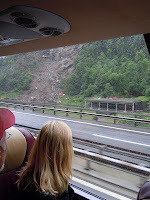 The consequences for us (considerably worse for anyone directly affected or repairing the rock slide) were a doubling of time for the length of the journey and multiple changes from train to bus (to drive around the rock slide) to train again and then another train etc. We arrived in Lucerne late in the afternoon. The wait was worth it, whatever your preconceptions about Switzerland from the popular media they will probably be exceeded here. Lush green valleys and forests, towering snow capped mountains and crisp clean air was what awaited us a short walk from the train station. In fact our hotel was only a short walk from the train station, as this is a very small peaceful town. Like the hotel manager was quick to exclaim 'walk around for 10 minutes and you will have seen everything' (he slightly understated the size of the town but it was small). Another plus was that directly across the road was a health shop that had a whole gluten free corner where I quickly purchased some muesli bars. I was really starting to like it here. The next day we spent getting to know the town itself by walking. Erika and Paul bought some new jackets as it was cold and wet, we went and saw the 'Lion Monument' a monument created for the Swiss mercenaries that died while fighting with the French and then we saw one of the town's greatest archeological finds from a guy trying to build a wine cellar. The Gletschergarten displays 20 million years of geological and town history demonstrated through archeological digs, multimedia and interactive displays. It was a fascinating education of how the Earth and this town has evolved until now. It finished with a hall of mirrors that had me perpetually banging into glass as it was very difficult to tell the true path from a mirror, and then a long walk up the hill behind to a cubby house (that was what it looked like) with brilliant views of the town to the mountains behind. As it started to rain Erika and Paul went shopping while Elizabeth and I continued to walk around the town finding our way up to the top of the rampart of the fortress that surrounds the town. The next day was our final day as we had only booked two nights here but our train was late in the afternoon and I had found out on 'Lonely Planet' that there was a terrific mountain to visit and a golden ticket that could be purchased for a memorable journey to it. So off we went to the lake and purchased our golden ticket to Mount Pilatus (not pilates). The first part of the journey consisted of a relaxing trip along Lake Lucerne to the base of the mountain. The water was still and the views from the boat were magnificent and within a too short period of time we were deposited at the base of the mountain. Second part of the journey was a ride up the steepest cog train in the world, and it was long and steep with again breathtaking views of the lake below and the Italian Alps beyond. Finally we reached the top where there was a hotel of all things. We looked around at the maps on the walls with the possible trails you could take and decided that we had time to reach the topmost point of the mountain (over 7000 feet). Off we went on a windy but solid trail around the mountain to where we would have had breathtaking views if it wasn't for all the clouds. We were able to make out the lake and the Italian Alps but the other side never revealed itself. Nevertheless it was an exhilarating and rewarding experience. Back at the hotel we were just in time to see a paraglider jump off the mountain and then the trip down consisted of a large cable car, with a large 'ooohhhh' moment as we broke through the clouds to see Lake Lucerne in all its glory below us, followed by a switch to a smaller cable car for the rest of the way. Then a bus trip back to town completed the vast array of rides afforded to us by this golden ticket. This is a must do if you ever get to Lucerne, it was a brilliant day and then we raced back to grab our bags and run to catch the train to Zurich. Awesome pic of lake lucerne! You should visit Jungfraujoch, it was really beautiful and you can try skiing and snowboarding!